Recently, I found myself a little sad that 2018 was ending, so I chose to take a mini vacation to recharge and prepare to start the New Year off right. After taking a long weekend in Idyllwild, CA, and having some time to be “just Kim”, I feel ready to start again. For almost two decades I’ve helped people with their loved ones homes, I can’t believe it’s been that long. It’s now the beginning of 2019 and it’s time to begin anew. What I’ve experienced year after year, is that the new year, for San Diego real estate, begins January 15th. Today is January 15th, and yesterday I received an email from a San Diego probate attorney. She shared that she had met me years ago and knew that I had a lot of experience helping people through the process of preparing, marketing and successfully selling a loved one’s home. Her client is in the process of being appointed as administrator of his mother’s estate. The decedent has a reverse mortgage and the attorney wants someone, like me, with experience dealing with the reverse mortgage company, because she feared that the home would become a foreclosure. Over the past two decades I’m grateful for a myriad of experiences dealing with mortgage companies and homes in probate. Some of the experience is with homes that were in the process of a foreclosure, and I’ve managed to help the administrator or executor go through the daunting task of a short sale. 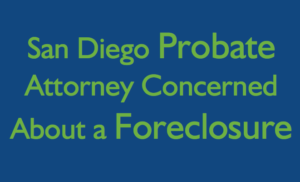 Even preserving the payment for the administrator or executor and the San Diego probate attorney. One case I helped with had nine months of unpaid homeowner association dues, and my skilled negations resulted in the mortgage company paying for those fees, as well as, the property taxes. What I know is that mortgage lenders are debt collectors. They don’t want to become owners of the property; they want to settle if at all possible. That’s were my experience will give the estate the best shot at a great outcome. That outcome being an eventually sold property, the debt paid, and the executor or administrator, as well as, the probate attorney paid for all their efforts. Keep in mind that the process is anything but short when involved in a “short sale”. There will be a lot of documentation, and a lot of waiting for the lender to respond to each task. The documentation will be the responsibility of the executor or administrator, and my team will be helping them to “press the easy button”, with clear communication and direction. You’ll be happy to know that, in the case of a foreclosure, my team will manage all of the hundreds of tasks that need to be handled with the lender. This is on top of the typical tasks to prepare the home in probate for sale. We have helped hundreds of executors and administrators with all the details, including helping with how to address the decedents personal property. Experience shows that addressing the personal property is the most stressful part of being responsible for a loved one’s estate. I’ve written a book specifically for San Diego area executors and administrators. I’d be happy to send you a free copy or you feel comfortable contacting me, Kim Ward, at 619-741-0111 to talk about your exact circumstances.